It's no secret I like beer. 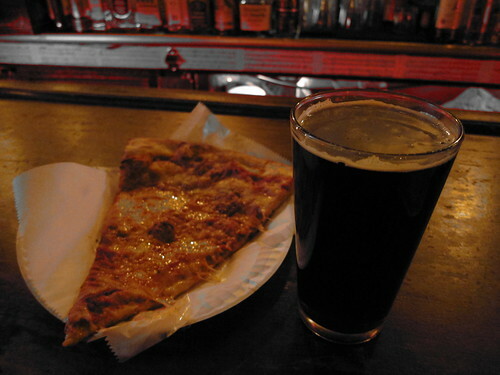 This is a picture of the beer and pizza I walked 20 minutes in a freaking blizzard for. Because I was bored, and I needed a beer. (Eating's also good.) One thing I love about the fall high season is there's some great beer-centric events on the calendar. Here are two you might want to check out. On October 6th, Village Voice brings its excellent fun times to Brooklyn with Brooklyn Pour. Do you see that list of brewers on tap? There's 60. I'm not naming them all here, but it includes some of my personal favorites: Ommegang, Kelso, Victory, Narragansett. I'm such a sucker for Narragansetts right now. There's going to be food too, including lobster tacos, sausages, and pretzels. But you're really going for the beer, and to maybe pick the brain of the brewers. Then November 17th, Beerathon returns. It's where a bunch of people try to drink 26 beers at 26 different bars throughout the East Village/West Village area. I attempted such feats last year, only making it to around 13 before hopping in a cab home. With the right group of people, it's completely a great way to spend your Saturday afternoon. 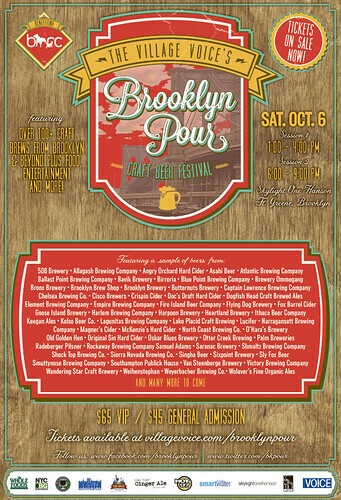 Brooklyn Pour is Saturday, October 6th at One Hanson in Fort Green, Brooklyn. Tickets are still on sale ($65 for VIP, $45 for General Admission) and can be bought here. New York City Beerathon goes down Saturday, November 17th, with its $85 tickets on sale here. Shake Shack New Haven's Menu Revealed!